Natalie Frank, Dancer I, 2017, Oil on canvas, 72 x 62 inches. Rhona Hoffman Gallery is pleased to present the gallery’s second solo show with New York-based painter Natalie Frank. Dancers and Dominas features a colorful environment of large-scale, gestural oil on canvas paintings of dancers and dominatrices in public and private performance. 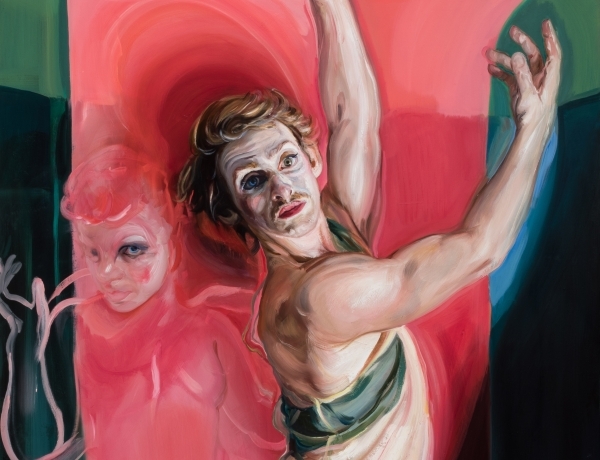 Natalie Frank’s Domina paintings mark the first investigation of this subject in oil portraiture, while the Dancer paintings tackle the classical theme of ballet with unique perspective. Posed with arms gracefully curved, toes pointed, and muscles flexed, athletic male and female dancers dominate their space and meet the audience with their gaze. As opposed to Impressionistic depictions by Edgar Degas or Toulouse Lautrec, Natalie Frank directly and assertively explores how these individual performers shape drama and narrative; her feminist perspective enters into a larger dialogue on the body’s power and sexuality. Just as dancers and dominatrices shape narratives through the body’s positioning and movement, Natalie Frank has used oil painting and the brush to represent female identity and subvert figurative painting’s male-dominated dialogue. Her practice has consistently questioned power, confronted historical narratives through a feminist perspective, and explored female identity through sexuality. In Dancers and Dominas, Natalie Frank’s rich imagination, jewel-like color palette, close cropping, compositional framing, and painterly brushstrokes further enhance the drama and performance of these psychologically charged, larger than life scenes. Natalie Frank received her MFA at Columbia University and BA from Yale University. Her 2015 exhibition Grimm’s Fairy Tales organized by The Drawing Center, New York traveled to the Blanton Museum of Art, UT Austin, and the Kentucky Art Museum. The accompanying catalogue Tales of the Brothers Grimm features Natalie Frank’s 75 color illustrations with a feminist interpretation of the unsanitized fairytales, and essays by Linda Nochlin, Claire Gilman, Jack Zipes, and Julie Taymor. Natalie Frank’s second collaboration with fairy tale scholar Jack Zipes is The Sorcerer's Apprentice, (Princeton University Press) 2017. Frank has exhibited widely at Mitchell-Innes and Nash, New York; Rhona Hoffman Gallery, Chicago; ACME, Los Angeles; Exit Art, New York; Arndt & Partner, Berlin, Zurich; Istanbul74, Turkey; The Rose Art Museum, Massachusetts; The Bowdoin College Museum of Art, Maine; The Granary (curated by Melva Bucksbaum), Connecticut; London Museum of Design, UK; The National Academy Museum, NY; Pennsylvania Academy of Fine Arts, Pennsylvania; Montclair Art Museum, New Jersey; The Brooklyn Museum, New York. In 2003-4, Frank was awarded a Fulbright Scholarship to study Edward Munch in Oslo, Norway, as a guest student at the National Academy of the Arts.